WAIST HIGH: Blow Monkeys New Album Now Available For Pre-Order. 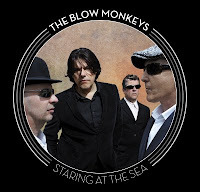 Blow Monkeys New Album Now Available For Pre-Order. It has been 27 years since The Blow Monkeys' debut, Limping for a Generation, an elegant pop-soul confection influenced by both Bryan Ferry and The Style Council, singer Dr. Robert was all pseudo-sophistication, his voice latte-smooth, while the band's career highlights "Digging Your Scene," (1986) and "It Doesn't Have To Be This Way," (1987) oozed arch poise and biting polemic. From theblowmonkeys.com: The time has come - pre-orders can be taken for the outstanding new album from The Blow Monkeys - Staring at the Sea. The Blow Monkeys will also be playing a very special album launch at a secret location in London in mid Febuary...keep an eye out for more infomation and free tickets for fans. Also the video for "Steppin Down" will be posted on the site in February. Details to follow. Finally plans are afoot for a six date UK Tour in the Spring...and this dear followers of all things Fencat...is only the beginning.